She was reassigned to help conquer the Council Dome with Zair and Durlyn in her squad. They encounter Vierynda’diira who joins their squad after telling them the rest of her squad is dead. Vierynda’diira shows them a nether gate that was carved into a poor child. She uses Earth arts to provide a shield for Vierynda’diira to close the gate. He was reassigned with Durlyn to help conquer the Council Dome under Jak’iaah. They encounter Vierynda’diira who joins their squad after telling them the rest of her squad is dead. Vierynda’diira shows them a nether gate that was carved into a poor child. He pulls Durlyn to safety after he got hit by a sniper. He was reassigned with Zair to help conquer the Council Dome under Jak’iaah. They encounter Vierynda’diira who joins their squad after telling them the rest of her squad is dead. Vierynda’diira shows them a nether gate that was carved into a poor child. Durlyn lets his guard down in shock and a sniper gets him in the arm. Kingpower said here she was from the Dutan'vir. She wears blue and red clothes in addition to her armor. Vierynda’diira’s squad died after being led into an ambush by an enemy sniper. After euthanizing her injured wolf, Jak’iaah’s squad encountered her. She warns them of the enemy sniper. Jak invites her to join her squad which she accepts. Vierynda’diira tells them of a gate which was carved into an unlucky child. She closes the gate by using her blood affinity to pull the mana stone out of the child. She wears brown clothes and has some sort of tattoo on her right arm. Her white hair is tied into twin ponytails. She likes naming her weapons and is also a hedonist. 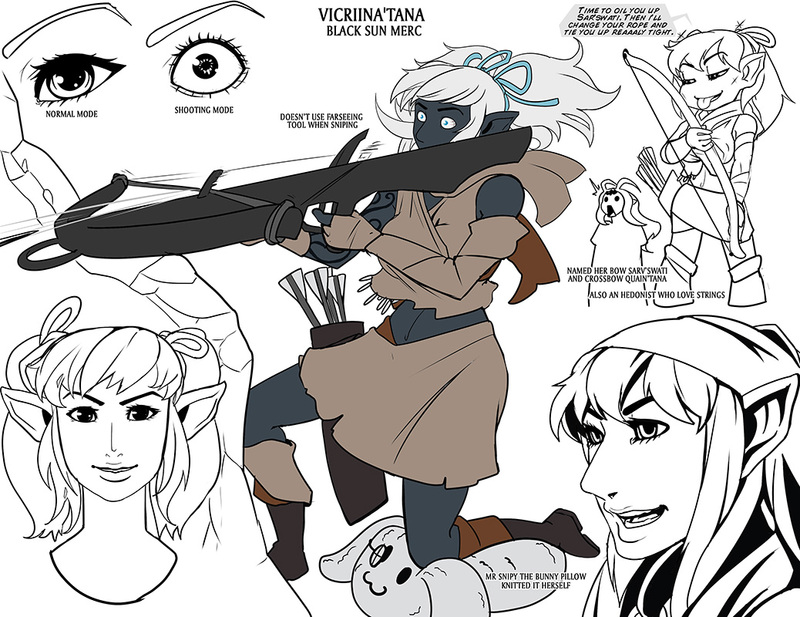 Vicriina’tana lured several Sarghress soldiers into an ambush. She managed to hit Durlyn when he let his guard down but decided to stop firing after Jak used Earth arts to create a shield wall. She then witnessed the Sarghress golems breaking through the trenches and taking on the dragon riders. After the Sarghress were fended of, a fellow [[Siyah’khorshed]] tells her it’s time for them to go. "''You won’t be getting these two, Quain’tana, but maybe the taint will kill them.''" During the Sarghress assault on the Council Dome, Vierynda’diira’s squad died after being led into an ambush by an enemy sniper. After euthanizing her injured wolf, Jak’iaah’s squad encountered her. She warns them of the enemy sniper. Jak invites her to join her squad which she accepts. Vierynda’diira tells them of a gate which was carved into an unlucky child. She closes the gate by using her blood affinity to pull the mana stone out of the child. 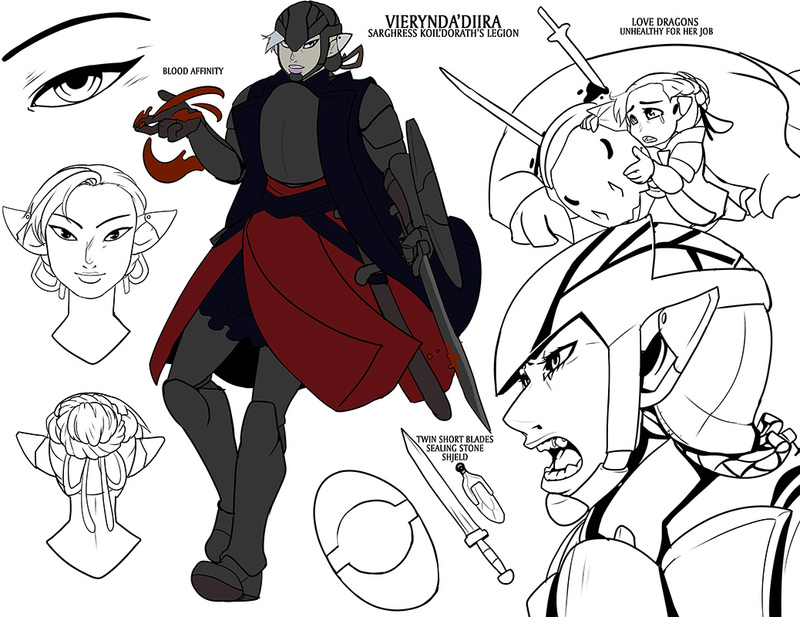 Image:Viecon.jpg|Official concept art of Vierynda'diira. Btw, I don't see that specific apostrophe on my laptop keyboard. Is there a way for me to put it while typing? Edit: Nevermind, I see it. partner555 wrote: Oh err, umm, sorry? Yeah I don't know what the hell is up with the apostrophe situation, but apparently there are two different types that look identical in certain fonts. One of those fonts happens to be the font of the wiki headers. It's caused some serious confusion with the page titles in the past. Thanks again for the submissions!